Categories: Divine Names, Sri Vallabhacharya. 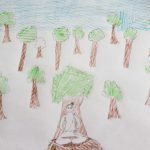 Srimad Bhagavatam says “kalau kalau bhavishyanti Narayana parAyanAh”- the devotees of the Lord come down to the earth to show the path of Bhagavata Dharma. The Lord sends his devotees who are Avatara Purushas to spread the glory of Bhagavata Dharma. Sri Vallabhacharya was one such Avatara Purusha. He came from an Andhra family of scholars. His father was Sri Lakshmana Bhattar and mother was Illamma and they were living in Varanasi. There was a legend in their family that when the family completes ‘100 Soma Yagas’, the lineage will be blessed with a divine child. It was the period when Mughal invasions were causing the Hindus to run for their lives. Lakshmana Bhattar and Illamma, who was pregnant, fled from Kasi and started moving to South India. Illama delivered a baby boy in Champakaranyam forest in Madhya Pradesh. The baby did not show any signs of life. They thought that the baby was dead and left the baby in the forest with deep sorrow. 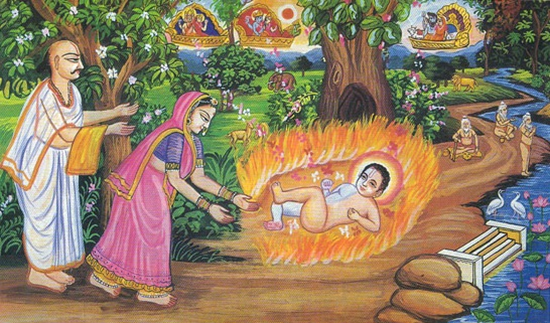 That night the Lord came in Sri Lakshmana Bhattar’s dream and told them that the baby was alive. Immediately the parents rushed to the forest to get the baby. They saw the entire place was surrounded by fire and that a snake was protecting the little child who was alive. Illamma rushed through the fire and it gave way like how Yamuna gave way to Vasudeva. 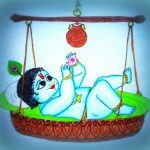 The child was rescued and he was named Vaishvanara and Sri Vallabha. He was the youngest child. He had an elder brother named Sri Ramakrishna and two sisters Savitri and Saraswati. The day Vallabhacharya was born was the day that Srinathji (murthi in the form of Govardhana-dhari) was discovered by Sri Madhavendrapuri, another great saint. Srinathji later became Vallabhacharya’s puja murthi. The child grew up to be a very intelligent boy and learnt all the scriptures very quickly. He also earned the title “Bala Saraswati” because of his mastery in scriptures. He got married to Akkamma Devi and had two sons Gopinatha and Vittalanath. 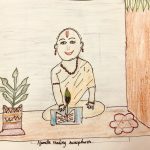 Sri Vallabhacharya had many disciples among whom were Surdas who was a famous poet, Krishnadas, Kumbhandas and Paramanandadas. Sri Vallabha put these disciples to serve Lord Srinathji. Sri Vallabhacharya’s Jayanthi falls on April 15, 2015. Sri Vallabhacharya’s path is known as Pushti Marga, the path of Grace.